The Hanover Girls’ Choir under the direction of Gudrun Schröfel combines two of Benjamin Britten’s works that could hardly be more different. They have thus demonstrated here the breadth of Britten’s compositional talent, and at the same time, how multi-faceted and versatile their own musicianship can be. Since A Ceremony of Carols was composed, it has been adopted as an integral part of the standard repertoire for children and/or women’s choirs. Highly singable melodies and atmospheric dance-like harp tones, which Birgit Bachhuber so artistically elicits from her instrument here, would almost have us forget under what adverse conditions this timeless classic actually came into being: on board a ship on the return voyage across the Atlantic from the USA back to England, where WWII was raging. But there is nothing to be heard of adversity on this recording – quite the contrary, since the Hanover Girls’ Choir invite us here to a bona fide celebration of these carols. And with Children’s Crusade, both the choir and the Ensemble S have dedicated themselves to a true rarity. 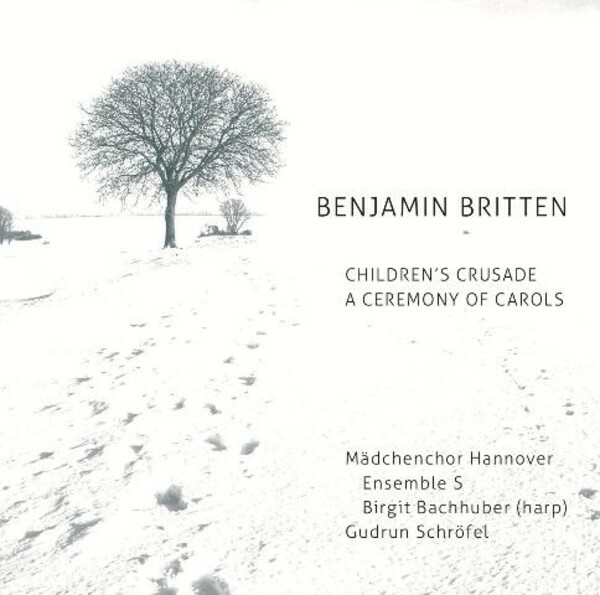 The complicated musical setting by Britten for the Children’s Crusade by Bertold Brecht, a ballad from the year 1941, allows one of the rarely performed pieces by the great British composer to be heard. The harrowing tale of a group of children fleeing from poverty in war-torn Poland in 1939, and who are seeking a country where freedom reigns, offers listeners a vivid insight into their world. As thematically contrasting as the works on this CD are, they nevertheless complement one another in a formidable manner.